Which is why it's gonna be AWESOME! I love these kinds of shows. Girly, yet seinen. This gives me an excuse to watch girls being cute 24/7, I can just say "It's for the guns!". Heh. Yeah. Extremely crisp art and animation, pretty good humour, and of course accurate weaponry. It's not going to be informative and educational on the same levels as Upotte or GuP (since it's airsoft and not, ya know, real guns [or tanks]) but I'm still gonna have a lot of fun with this one. I hope you do too! Generic sports shounen?... I think NOT! Sonora - Leader and MVP of the team. Rento - Very friendly, but not too bright. Resident airhead of the series. Karila - Blonde hair & is very outgoing. She's known to be irresponsible at times. Honoka - Dark hair in pigtails. Your cliche glasses character. Yachiyo - Supposedly an energetic character, but she lacks presence. The characters overall were alright, not great, just alright. The characters may have slightly varied elements placed into them in an attempt to add "flavor" but they all eventually fall into their respective(?) cliche categories. Except for Yura. . .
Why was Yura different you ask? Well, for one she actually felt like a real character, sort of. Arguably I guess you could say she was nothing new to behold but AT LEAST she developed over time. You can debate weather or not her character progression was actually good or not, but I think studio Gainax actually did decent job here. And I honestly feel much more satisfied seeing the characters interactions evolve over time than I would have if Yura's personalty had never changed. There is no over-arcing storyline or concept that needs to be followed here. Of course, another school exists solely to rival them in the sport, so it would seem that this anime doesn't really have many elements past those of most sports shounen. Or so I thought. . .
You'd expect this series to be focused on C3-Bu beating their rival team, but that's not at all what I took from the experience. About half-way through the series we start to see the plot digress from the oh-so standard cliche route, and instead begin to lead somewhere more interesting. You're still going to see an incorporation of the sport, but you will also see a defined increasing focus on Yura's character as the episodes progress. This I really enjoyed. Seeing this anime break away from the norms and make use of it's potential was satisfying. I'm not saying that the plot couldn't have been improved on, because this clearly wasn't a plot focused anime. I'm just saying the story actually worked with the character progression opposed to solely focusing on the sport aspect of the series. And this managed to produce a better story-line than most average anime titles provide us with. For those of you looking for a light-hearted anime with moderate comedy and a few serious elements, look no further. I actually liked the OP and ED themes. The BGM performed its purpose of setting the mood. Albeit most the tracks on here aren't good enough to warrant listening to on their own, they still do the series enough justice to deserve the mediocre award. Good job soundtrack! You deserve it! Studio Gainax obviously knows what they're doing. I don't really think I need to say much here because I highly doubt anybody will have an issue with the art or animation quality. I was decently entertained throughout the series. I liked how the plot complemented Yura's character progression. However, I partially disliked how the characters interacted as a whole. I was able to eventually accept their actions (because anime logic) but I couldn't really wrap my mind around the motives that drove said actions. Yura in particular felt very un-relatable and I couldn't help but view some of her decision-making as being seemingly forced. The supporting cast didn't FEEL very supporting either. . . I wonder why they would call it a supporting cast then? This anime has a few redeeming values, therefore if you're intrigued feel free to watch. However, I would not consider this to be a "must watch". So you may also skip this series if you'd like, you wont be missing out. [+] Show makes use of some potential and avoids the "Generic shounen" death sentence. [+] Main character developed past her initial trope. [-] Some stages of the anime felt awkward or unrefined. [-] The story manages to stay interesting but is fundamentally flawed on several levels. Rough story, yet still very presentable and entertaining to view. The series makes decent use of what tools it has, but only manages to amount half of its potential in the final product. Reviewed by HG, revised and edited by RAZ. This is a show is a coming of age saga that starts out very much in a fun camping trip sort of manner, but after you get a ways in, you find that you are in for a serious hike in the deep woods. Yura is a new high school student attempting to start fresh at Stella Women's Academy, and desperate to leave her introverted past behind her. Drawn in by the schools air-soft team after she is caught playing out a fantasy in her mind, she makes friends and sets out to change herself. Her personal journey has many interesting twists and events as she tries to find her way, and there is a surprising depth of character development as the story develops. Although it will become hard to watch some of the mistakes, bad choices, and trials that she encounters, there are many things to learn as you share in her story of growth. I believe her path is not as far fetched as some might think if you remember that she is trying to escape an introverted past, and lacks many of the social experience that others would take for granted. Well worth your time to watch if you are looking for more than just a happy-go-lucky story. After seeing the first episode, all I will say is WOW. It started out as a typical girls in school, by the end of the episode I am cheering and ROFLMAO. The best description I can come up with is a more comedic "GIRLS und PANZER". Based on the opening episode's Gunfight(Much better and more realistic than most movies), in which I was both cheering and Laughing Out Loud. If you like comedy laughing and "GIRLS und PANZER" this anime is for you. For those of you who are unfamiliar with goosebumps. Yes, I came into this series thinking that it would be a fun school series about paintball, but I was completely wrong. Starting with the first episode (and let's just say it now: it was one of the best episodes of the series...not a compliment by far) we have a very slow first half that introduces the main character to the school. I nearly fell asleep during it. Nonetheless, I was immediately rewarded at the halfway point with some great paintball action. Yet, this is not the worst this series can do. The friendships and personal problems of the main character are extremely forced and unnatural. The way that she is so self-centered is almost unbelievable. Again, I really wanted to like this series, and there were two characters that I did like despite the series. Overall, it was just a huge let-down. I thoroughly enjoy animes such as Stella Woman's Academy. Instead of dealing with complicated romance webs, over the top insanity, and just weird characters, you get a light hearted, feel good anime about a girls' club and their adventures as they enjoy doing what they love, and discover more about themselves in the process. A Slice of Life full of surprises. From the very first episode, it is easy to appreciate the animation quality, the music, and the lighthearted plot. Watching the first episode's unique theme and presentation serves as a solid indicator as to whether or not the show is worth your time. With that being said, the series additionally goes through some major twists and turns which can either make or break the experience for you. Personally, the Important Haircut is my least favorite trope in all existence, and this series's main character Yura went through more dramatic changes than most people would have wanted. But to be perfectly honest, the character developments kept the experience engaging and leaving the viewer wanting to see how the series will resolve. That is what I learned to appreciate the most. One factor going against the series would be the imbalance of character development between some of the girls that would have been more interesting to expand upon. That also leads to another subtle thing to appreciate about the series. If you manage to watch this show to the last episode, you will be in for a surprise that most of the characters that did not get to do anything significant in the series really shine in the last episode. The episode I speak of is what's known as a fanservice episode, but the overall placement and execution of it was stellar (no pun intended). Overall I found this series very enjoyable for its premise. This is one of the few anime this year that puts value into quality, and those kinds of anime are always appreciated! Stella has a hard time deciding what it wants to do. Starts out fun, takes itself a little too seriously, then comes back towards fun without actually getting there. It should have stuck with fun. Girls and airsoft isn't a strong enough base to carry the kind of drama that is injected later in the show. There is very little danger and no romance (although you can detect a hint of yuri here and there.) There is also very little fan service, if that's what your looking for (if it is, just watch the last episode.) 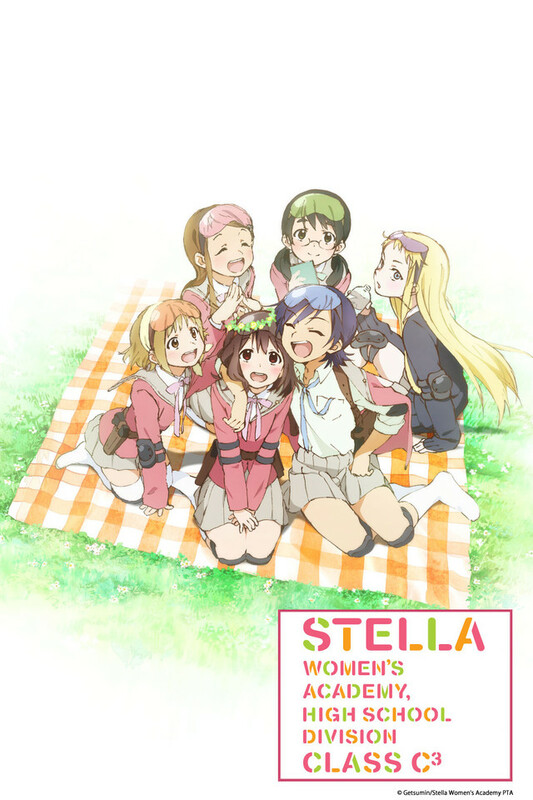 Stella does have distinct characters with good chemistry, and it is quite funny when it tries to be. Unfortunately, it doesn't try to be enough of the time.